YouTube/The CyberWireGoogle security researcher Ian Beer at a talk in 2015. Google runs a team called Project Zero that tries to find vulnerabilities in competitors’ software. One of its star members focusing on Apple products is Ian Beer. He slammed Apple at the end of a talk at the Black Hat conference in Las Vegas because he has not been invited to Apple’s bug bounty program, he said. 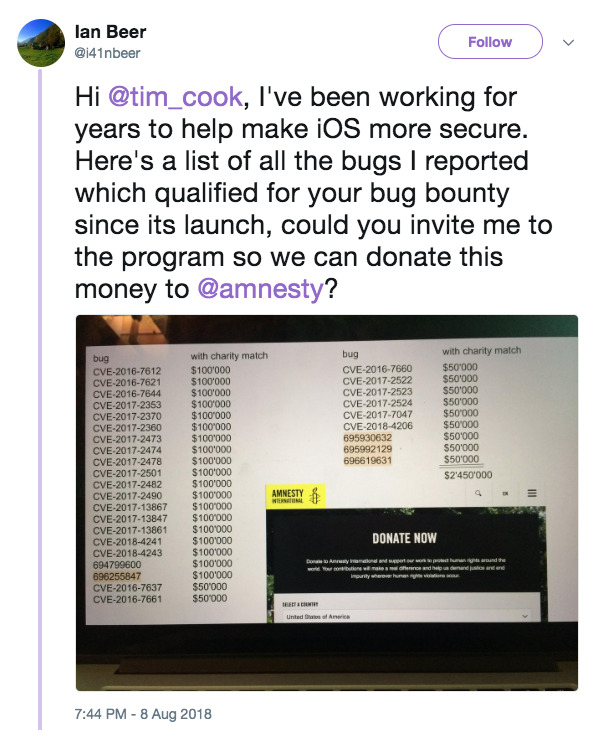 One of the best security researchers in the world publicly criticised Apple’s bug bounty program and challenged Apple CEO Tim Cook to donate $US2.45 million to charity, the amount he says he should have received had he been a part of the program. “Hi @tim_cook, I’ve been working for years to help make iOS more secure. Here’s a list of all the bugs I reported which qualified for your bug bounty since its launch, could you invite me to the program so we can donate this money to @amnesty?” Ian Beer, a Google employee, tweeted during a talk at Black Hat, a high-profile security conference in Las Vegas. 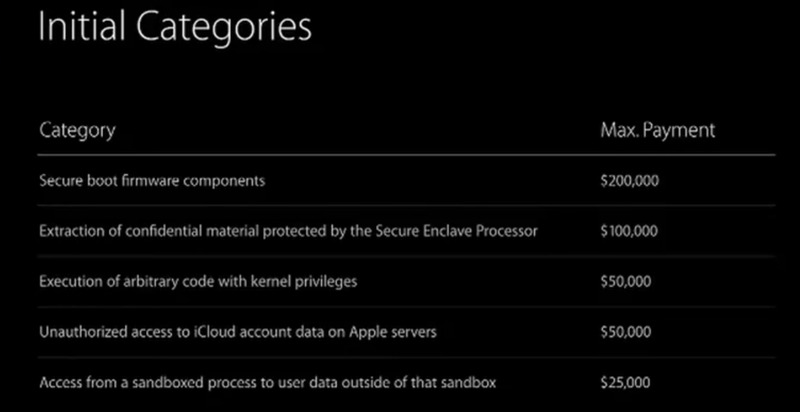 At the end of his talk, which was a technical look at iOS security, he veered into criticism of Apple. “I don’t think Apple intended to use the bug bounty program as a PR tool, but obviously it’s given them plenty of good PR; these supposedly high prices are frequently quoted and, like the million dollar dissident, used as this comfort blanket you can wrap yourself in,” he wrote in notes published along his slide deck, which he tweeted on Thursday. 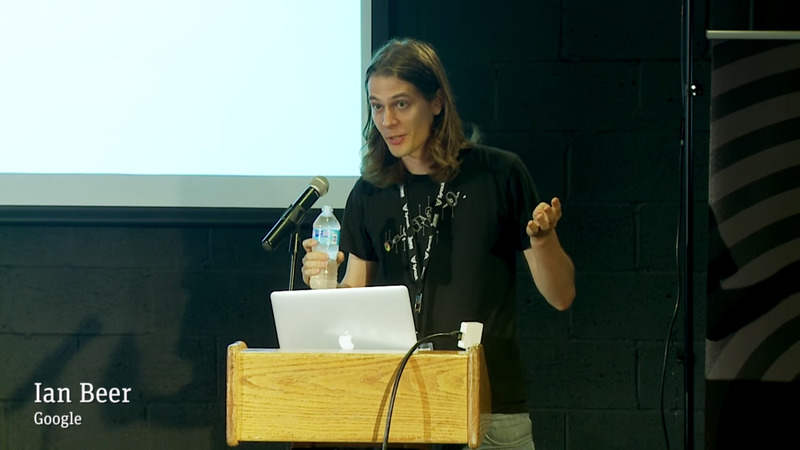 Beer is one of the most prolific security researchers in the world. He and the group he works for inside Google, Project Zero, frequently find bugs that Apple patches to make its software more secure. If you add up all prices for bugs he’s found, then double it as if Apple were to match the money for charity, it would come out to $US2.45 million, Beer wrote. Bug bounties are payouts typically intended for independent security researchers to incentivise them to report bad bugs instead of developing them into exploits or selling them into the black market. Basically: Report what’s called a “zero-day,” a previously undiscovered bug, and if it’s real, you can get some money. 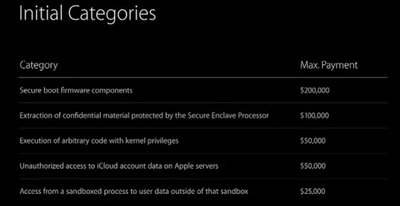 Apple’s bug bounty program offers big payouts, like those listed above, but unusually, it’s an invite-only program. Apple launched it in 2016, after most other big tech companies had previously launched their bug bounty programs. Even if you found the biggest exploit in iPhone software, you wouldn’t get paid by Apple unless you were part of the program. But Beer draws a salary from Google as part of one of the strongest bug-hunting teams in the world, which itself is unusual. Beer works for Google on its elite Project Zero team, which finds undiscovered bugs in software – even those made by other companies, like Apple, or CloudFlare, or Microsoft. By responsibly squashing those bugs, the team makes software safer for everyone. Project Zero has been controversial – after all, what it does is it tries to break other companies’ software, and when it succeeds, it forces the other company to fix it within 90 days. The origins of the program date back to Google cofounder Sergey Brin’s frustration that vulnerabilities from other companies could make Google less secure. Apple’s iPhone security is very tight and has a reputation in the security industry for being hard to crack. But it’s not bulletproof – in 2016, the UAE government used a weaponised zero-day exploit against a human rights activist. The high level of iPhone security means that sometimes researchers can make far more money selling zero-days on the black market than cooperating with Apple. So that makes people like Beer even more notable, given their prolific ability to find iPhone bugs. It’s unclear if there was a specific reason Beer went public with his complaints about how Apple handles vulnerabilities and disclosures. He said in the notes alongside his talk that it was because Apple does a “poor job of fixing” the bugs he reports. But Apple’s culture of discretion means it’s unlikely that Cook or Apple will respond warmly to his proposal, either publicly or privately.